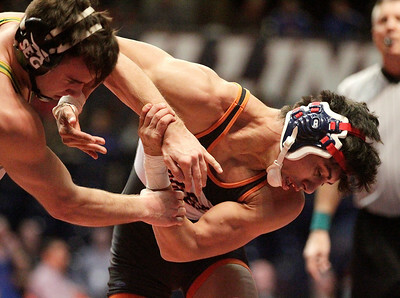 Matthew Apgar - mapgar@shawmedia.com Joe Bianchini of Immaculate Conception, front, works out of the grasp of Drew Sobol of Wood River during their IHSA Class 1A 106 pound state championship semifinals bout on Friday, Feb. 19, 2016 at the University of Illinois at Urbana–Champaign's State Farm Center in Champaign. Matthew Apgar - mapgar@shawmedia.com Joe Bianchini of Immaculate Conception, right, takes control of Drew Sobol of Wood River during their IHSA Class 1A 106 pound state championship semifinals bout on Friday, Feb. 19, 2016 at the University of Illinois at Urbana–Champaign's State Farm Center in Champaign. 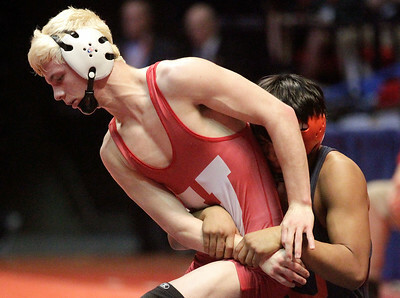 Matthew Apgar - mapgar@shawmedia.com during the IHSA state championship tournament on Friday, Feb. 19, 2016 at the University of Illinois at Urbana–Champaign's State Farm Center in Champaign. 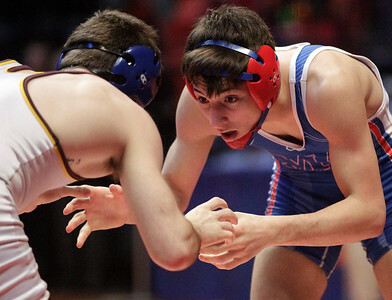 Matthew Apgar - mapgar@shawmedia.com Anthony Cheloni of Marmion right, graples with Dylan Duncan of Montini in their IHSA class 3A 132 pound state championship semifinal bout on Friday, Feb. 19, 2016 at the University of Illinois at Urbana–Champaign's State Farm Center in Champaign. Matthew Apgar - mapgar@shawmedia.com Crystal Lake Central's Lenny Petersen grapples with Morton's Mikie Hartnett during their IHSA Class 2A 138 pound state championship semifinals bout on Friday, Feb. 19, 2016 at the University of Illinois at Urbana–Champaign's State Farm Center in Champaign. Petersen won when referees determined that Hartnett could not continue after injuring his right knee in the bout. 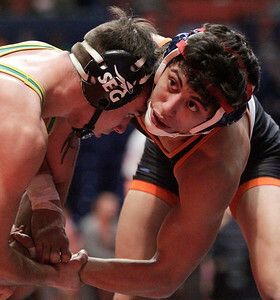 Matthew Apgar - mapgar@shawmedia.com Crystal Lake Central's Mike Petersen, right, grapples with Hunter Grau of Geneseo during their IHSA Class 2A 145 pound state championship semifinals bout on Friday, Feb. 19, 2016 at the University of Illinois at Urbana–Champaign's State Farm Center in Champaign. Matthew Apgar - mapgar@shawmedia.com Austin Kedzie of Kaneland, front, grapples with Chris Kennedy of Lincoln-Way West during their IHSA class 2A 106 pound state championship semifinal bout on Friday, Feb. 19, 2016 at the University of Illinois at Urbana–Champaign's State Farm Center in Champaign. Matthew Apgar - mapgar@shawmedia.com Crystal Lake Central's Mike Petersen, right, gets put on his back by Hunter Grau of Geneseo during their IHSA Class 2A 145 pound state championship semifinals bout on Friday, Feb. 19, 2016 at the University of Illinois at Urbana–Champaign's State Farm Center in Champaign. 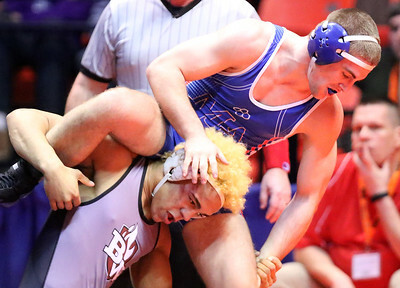 Matthew Apgar - mapgar@shawmedia.com Woodstock's Kevin Zange takes control of Jose Champagne's leg during their IHSA class 2A 160 poundstate championship semifinals bout on Friday, Feb. 19, 2016 at the University of Illinois at Urbana–Champaign's State Farm Center in Champaign. 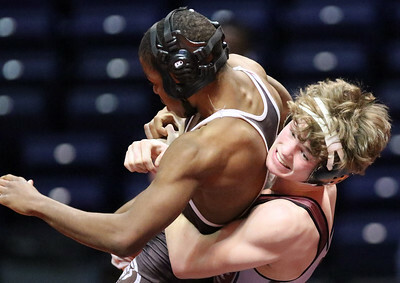 Matthew Apgar - mapgar@shawmedia.com Prairie Ridge's Travis Piotrowski lifts Mount Carmel's Yahya Thomas into the air during their IHSA class 2A state championship semifinals bout on Friday, Feb. 19, 2016 at the University of Illinois at Urbana–Champaign's State Farm Center in Champaign. Matthew Apgar - mapgar@shawmedia.com Tyree Johnson of Downers Grove, left, grapples with Shayne Oster of Lockport during theor class 3A 145 pound IHSA state championship semifinals bout on Friday, Feb. 19, 2016 at the University of Illinois at Urbana–Champaign's State Farm Center in Champaign. 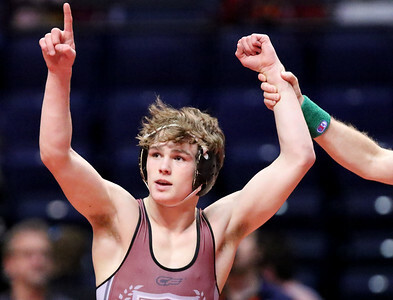 Matthew Apgar - mapgar@shawmedia.com Prairie Ridge's Travis Piotrowski celebrates his victory over Yahya Thomas from Mount Carmel during their IHSA class 2A 126 pound state championship semifinal on Friday, Feb. 19, 2016 at the University of Illinois at Urbana–Champaign's State Farm Center in Champaign. Matthew Apgar - mapgar@shawmedia.com Trace Carello of Marmion, top, wrestles against Nick Foster of Belleville West during their IHSA class 3A 152 pound state championship semifinals bout on Friday, Feb. 19, 2016 at the University of Illinois at Urbana–Champaign's State Farm Center in Champaign. Crystal Lake Central's Mike Petersen, right, gets put on his back by Hunter Grau of Geneseo during their IHSA Class 2A 145 pound state championship semifinals bout on Friday, Feb. 19, 2016 at the University of Illinois at Urbana–Champaign's State Farm Center in Champaign.